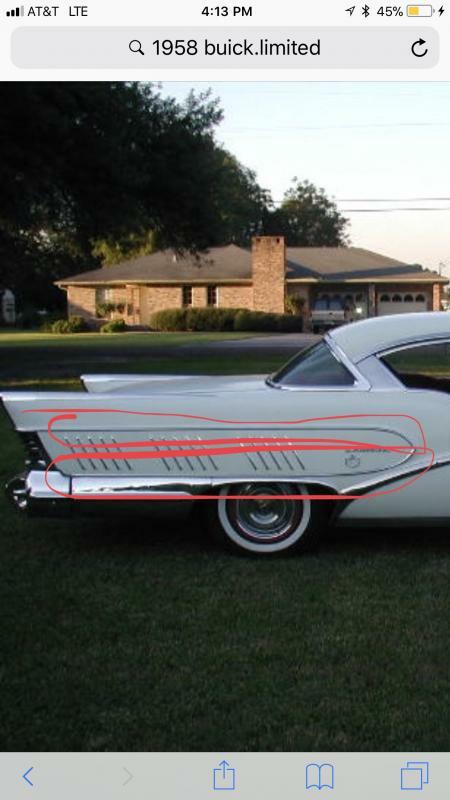 Im looking for a few parts for a 58 Buick Limited 2 dr.
- passenger side door panel. Blue, but would take any color in any condition. Roadmaster or Limited will work. - limited only rear 1/4 trim. I attached a picture and circled ones needed. - any other 2 dr Limited only side trim I may also be interested in. I may also buy 4 dr limited rear side trim and splice together if anyone has that. Hello, the junkyard may have the lower pieces, but I'll need another visit to see exactly what he has. I'll have to get back to you next time I go, which may be 2-3 weeks.